Well, the 2018 Jeep Grand Cherokee Trackhawk didn’t turn out to be cheap at all, did it? With the pricing on the 707 horsepower Hellcat-Jeep, Fiat Chrysler’s SRT division further cements itself as America’s AMG, but that power has a high price tag. Jeep announced this week that the new Trackhawk will have an MSRP of $85,900, excluding $1,095 destination. 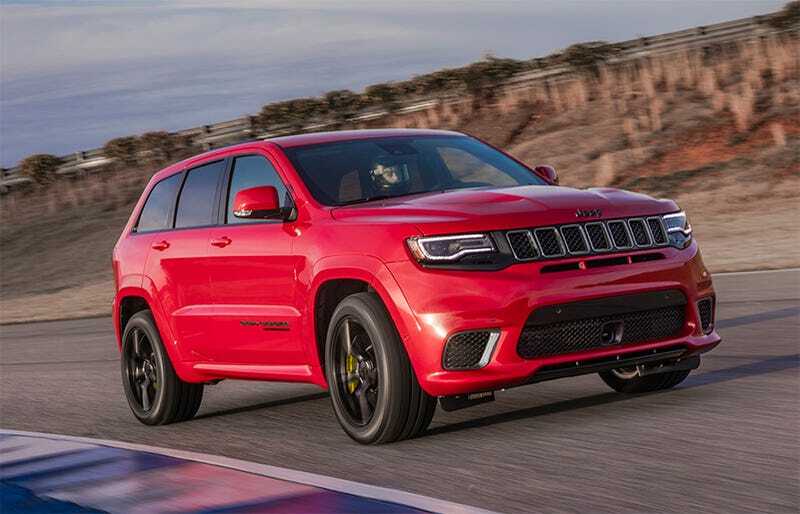 That’s a substantial leap from the lesser Grand Cherokee SRT, which runs $66,895 new. But hey, you get a lot more. The SRT makes do with a pathetic, painfully slow 475 hp, while the mighty Trackhawk can obliterate your enemies and make the people who bullied you in high school cry sad tears with its obscene 707 horses from its supercharged supercharged 6.2-liter V8. The big beast does zero to 60 mph in just 3.5 seconds, which was supercar territory not too long ago, and does the quarter mile in under 12 seconds with a top speed of 180 mph. It also has all sorts of insane off-roading goodies, being a Grand Cherokee and all, so when you dump 85 grand on this thing expect to plunder the wilderness at incredible velocities.